No matter how many you are traveling with on your next trip, we've got room for them all! With vacation rental options ranging from 1 to 5 bedroom options, larger homes boast more living space as well as more outdoor area for the entire gang to hang! 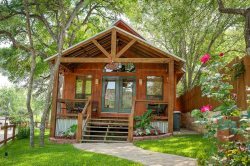 These 1 bedroom vacation rental properties are all located in beautiful New Braunfels. All properties are conveniently located to area attractions, and all units are fully furnished with kitchen necessities and linens. Book the home of your dreams now!